The concentrations of methane—the second most potent greenhouse gas— in the atmosphere are increasing by the day. Due to its powerful nature and rapid decomposition in the atmosphere, nations across the globe have identified the fact that decreasing methane emissions is an important step toward reducing global warming. Considering the new international climate agreement (i.e. the Paris Agreement), nations ought to precisely quantify their greenhouse gas emissions and carry out independent investigations on the report. 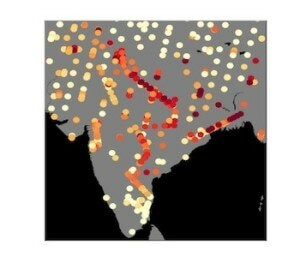 As part of one of the extensive independent investigations, Researchers at the University of Bristol have deduced that methane emissions in India have not increased much in the past few years and that the authorities in the country have been accurately reporting the emissions. This finding stands in contradiction to other nations such as China, where the emissions of methane have been found to have increased over the last few recent years, or the United States, where the reported emissions have been found to be largely discrepant from the monitored atmospheric observations. The goal of the research was to calibrate methane emissions in India using observations of methane concentration from the country’s atmosphere, which has been carried out for the first time in India at such a scale. The study has been published in the journal Nature Communications on October 10th, 2017. A sequence of observations—for example, from an aircraft, from the surface and from a satellite that measures global methane concentrations from space—were adopted to obtain the results for this research. The investigation was also performed to carry out an independent assessment of emissions to what has been reported by the Indian authorities to the United Framework Convention on Climate Change (UNFCCC) and to exhibit the value of the independent assessment. As found through measurements from the atmosphere rather than through the cataloguing done by countries, we showed that emission levels are consistent with India’s reports to the UNFCCC and that between 2010-2015 methane emissions did not show any significant growth. This information is very valuable to know—both for providing this independent check but also for learning how to improve the accounting process. The consolidated methane emissions in India are close to 10 times more than that in the United Kingdom. However, the per-person value is smaller. The country is one of the largest producers of the world’s rice yield and has the largest cattle population in the world. The research has demonstrated that every year, methane emissions increase from June to September due to continuous release of emissions, signaling the cultivation of rice, principally grown in this season and can be seen evidently. National monitoring of greenhouse gases needs to become a standard process that is done alongside current reporting practices. This is the only way we can ensure transparency and accuracy of the reports that are submitted to the UN. The Researchers look forward to adopting the technology developed as part of this research to investigate other tropical regions, methane emissions of which are not clearly known.